Kanhangad was a 3-day visit filled with regular activities. This time we had 21 people. Some came for one day and some for two days and some remained with us throughout the 3 days. Since the next day, all had planned to go Quilandy and Thallashery, the first day itself after being a while in the ashram caves and attending Arati, we left after lunch to Guruvan. This time, we had lots of little children, all divine in their own ways. i insisted that first all the little ones would go and spend some silent moments in the holy Guruvan caves and we did so. Then turn by turn all of them sat inside in groups and meditated. As soon as we came out fully loathed in the holy soil of the caves, there was a very heavy downpour that cleansed the soil from us. Swami Vidyanand was kind enough to make some hot tea for us and we gratefully had it. After the arati, we left back. Ganapathiji gave us company all the while. From here we called autos and went straight to Padiyar Swami's house and after spending time there, returned back to the ashram. After food, we we back in our rooms. The next morning, we all woke up early and left the ashram in two taxis to meet Amma and Achar Baba in Quilandy. At Amma's place when we went she was not there like last time, as she is most of the time wandering outside. This time, we knew what. We sat and connected with her. Within 10 minutes Amma walked from the streets into the house and straight to her floor bedding besides where we all sat and lied down. We sat there in her presence for quite some time. Then, we got up and offering our respects at her feet, we took leave of Shri. Jayesh who was Amma's caretaker and left towards Quilandy. Last time, we were able to go to Shri. Ishwar Iyerji's place where Baba Nityananda had grown up but we could not go to the jungle location where he was found as an infant. This spot is 12 kms from here. We drove straight to this place. After stopping the taxis, we had to walk quite a distance through narrow muddy roads that were carved through the muddy hills. This seemed to be a jungle even now with very few habitats. Finally, we reached the temple that was built at the location Bade Baba was first seen by Chathuamma. After spending some time here, the Auntys in the group shared eatables here, and this was shared with the local villagers too. Then, we walked back to our taxis and went to Ishwar Iyerji's place. From there we had our late lunch. It was 4 p.m. by now. After lunch, we visited Achar Baba's place. This time, the moment we sat down after bowing to Achar Baba, he, who speaks rarely, this time turned his head to the two little ones in the group He continuously muttered to them for almost all the time we sat there. He looked straight at them and spoke certain things which were not audible at all and at times he laughed. Ganapathyji gave all kids one by one something or the other to be offered to Baba and it was worth watching as they offered it to him. He looked at every little thing that was offered to him but as usual did not like anyone to touch him. After spending a good amount of time, we took his leave and he as usual nodded, or okayed with a head jerk or simply stayed silent as each bowed and took leave. We then went to Siddha Surya Narayan Jeeva Samadhi only to learn that the gentleman who we met last time had left his body just a fortnight back. Last time, he had taken to his house where the Siddha's room and bed were there, and had invited us for the function which he said would be done in a grand manner. The preparations for this function was visibly going on. He can be seen in the video of our last visit. This Samadhi is a powerful place as i had mentioned last time, and we sat inside the Samadhi place. Taking leave of the priest and the kind women there, we left back towards the ashram. It was 9:15 p.m. when we reached the ashram. Even after this entire day's activity and coming back late to the ashram, we did not want to go immediately to the rooms. Instead, we went up the Nityanand Samadhi Temple and sat there for a while. The energies of this place is awesome. After half hour we got back to our rooms and were happy to know that there was some food left for the hungry tummies. Quickly and silently, we went to the Annapoorna Hall and had our meals. A wandering swami was kind enough to help us with the food and serving. Then, we came back to our rooms. Some went to sleep and some of us sat down on the floor outside our rooms till about 1 a.m. All this while i was just awed with the most little 7-month-old Prathistha, who traveled with us everywhere! Such a tender little one with nothing but adorable smiles at whoever looked at her! Next day evening we all had to leave back home and none were actually in the mood to. We then went to sleep and woke up next day and were up in the Nityananda Samadhi Temple. There is a space just in front of the temple and some of just sat there in peace for sometime until the bells of the 7 a.m. arati rang at the temple. After attending this arati and the arati at Janananda Swami's Samadhi down, we had our breakfast and spent some time in the caves. Then, as planned, we left to Anand Ashram where we this time also were able to meet Swami Muktananda, the current caretaker of the ashram. He imparted a few words and blessings on everyone of us with biscuits as prasadam. The time spent in chanting "Shree Ram Jai Ram Jai Jai Ram" was mesmerizing in Swami Ramdas' home. This place is a magical place and one can just sink into the melodious chants and remain absorbed in a different world. After a delicious pure satvik food, we sat for a while in the premises and auto was called. We then left straight to back to the ashram and spent next few hours meditating or just sitting in the ashram. By 5 p.m. we were all ready and as the autos were to come a heavy downpour followed. By the time the autos reached the station, the rains stopped. We all left for the railway station from where all proceed to their respective homes. As i laid stretched in my sleeper seat, my eyes quickly ran through the wonders of this magical place and how after any number of visits, it can still seem to be the first time. Thanking Bade Baba and everyone who came there, it didn't take much effort to fall into deep sleep. 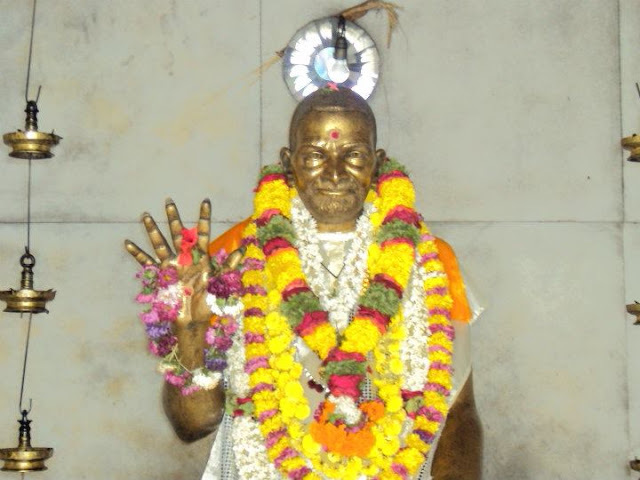 Namo Nityananda! Below video also contains pictures, videos and info from the previous article.